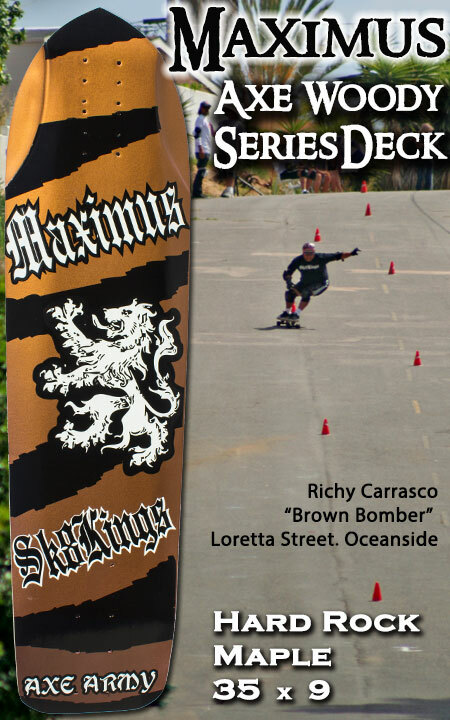 Maximus Woody is an extra-affordable all wood replica of the carbon fiber Ultimate Maximus with the same great features. Our Axe Series decks are your #1 choice for slalom racing, downhill speed, freeriding, long distance pumping and ditch blazing. The Maximus model is a wider tail full-sized deck great for turning at speed and is ideal for giant slalom, superG -- OR the perfect base for a Maryhill ripper setup. Overall dimensions: 35" x 9"
TORSION TAIL OPTION = mount in the kicktail for more flex and traction (use drill pattern in the kick tail angle) to set up for racing. Note: If you order the Torsion Tail Setup and a skid plate add on option -- the skid plate will come a la carte but deck will be drilled for skid plate mounting holes. EXTRA RISERS/MOUNTING HARDWARE-REAR TRUCK MOVE - Extra riser & mount hardware bundle is offered to move the rear truck to the Functional Kicktail Setup at your leisure. Choose option at checkout. FUNCTIONAL KICKTAIL OPTION WITH SKID PLATE = mount before the kicktail (use the pre-drilled truck mount in front of the kick) for a stiffer performance flex for riding parks & ditches and street cruising/LDP to pop the front end up over road obstacles in your path (railroad tracks, curbs, potholes, etc). King Plate IV (skid plate) recommended to protect your Maximus tail. Decks sold separately or as customized completes. AXE ARMY Special Offer: Add an AXE Army Tee or other logo of your choice - to your order at a special discount price. Specify size in the "Notes" section. You can substitute any logo tee depending on availability -- just indicate in notes.